Harrisburg's own radio station! 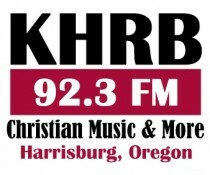 Tune into KHRB radio at 92.3 FM for commercial-free Christian radio as well as live broadcast's of Harrisburg High School sports. Click on the link to the left for details on HHS sports event broadcasts, both live and archived. We play LOTS of great, Christian music! When we're not playing music, we offer some fantastic Bible teaching programs.